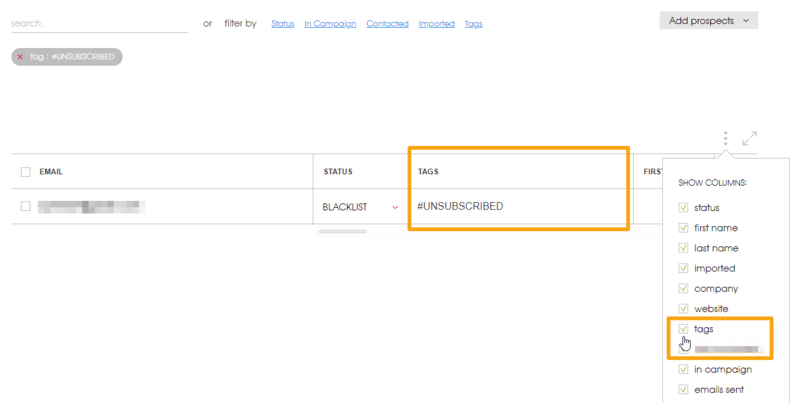 To let you find the prospects who have unsubscribed from your mailing list, we have introduced the #UNSUBSCRIBED tag. You can type the tag in or select it from the list. Sometimes you may need to scroll it, if you happen to have a long list. The tags are put in the alphabetical order, which means that you’ll find the #UNSUBSCRIBED tag at the end of the tag list. Q: You can see the list of prospects but can’t find the 'TAGS' column? A: Make sure you have the TAGS column shown. You can move this column by dragging it closer to the ‘Email’ section. Click on the column and drag it to the left. Now you can see the tag next to the 'Status'. Q: The 'TAGS' column is shown but I can't see the #UNSSUBSCRIBED tag? Why? 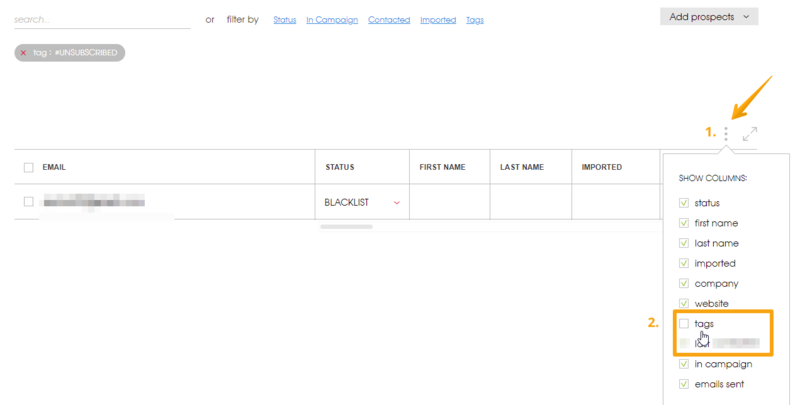 A: In one column you can find a couple of tags. Expand the cell to see all of them. Q: Will this tag be applied to the prospects who have had already unsubscribed? A: No, only to your contacts who opted out from August 20th onwards. Q: Can I see the prospects who have unsubscribed on the campaign level? A: Unfortunately no, not yet. We’re working on it though! Q: How can I see contacts who have unsubscribed from a particular campaign/with a certain status/...? A: To do so, please select both the appropriate filter (Status, In Campaign, Contacted, Imported) and #UNSUBSCRIBED tag from the ‘Tags’ filter.